9 Reasons Why Neonatal Nurses Are AWESOME. I am completely new to the NICU world; so new that I’ve never stepped foot inside one. However, for the past year I’ve had the amazing pleasure of working for a company that manufactures products for the world’s smallest patients. My time here at Beevers Medical Solutions has been spent learning A LOT about the NICU, premature babies, parents of premature babies/special needs children and about neonatal nursing. Every day I am inundated with blogs, websites and facebook posts all about journeys and experiences in the NICU. I gotta say, I don’t think I could do it. I don’t think I have the emotional reserve to be a neonatal nurse. Not to mention that I’ve never been to medical school and I’ve never worked for a hospital. I have a degree in Theatre which (for me) means I never took a biology class past 101. So more power to ya, neonatal nurses! You have my 100% support and respect. Even though I’ve never been a neonatal nurse, I AM a mother and I know what it means to nurture a child. I know what it feels like to be proud of small victories and to be there no matter what. It’s been a privilege to work for BMS. This company is comprised of a group of people doing their part to make a difference in the world. And that’s what I believe neonatal nurses do every day. So, I wanted to write down my thoughts, things that I’ve learned about neonatal nurses and why I am so in awe of the work they do. I respect it. I look up to it. And just want to say thanks. 1. Warm, Dark, Quiet. Babies in the NICU generally like things to be warm, dark and quiet. From what I can tell, nurses do the best they can to maintain this atmosphere for their patients. As much as they can let their babies “just be,” the better. That doesn’t mean they don’t check on them regularly and make adjustments to their care as needed but neonatal nurses allow their patients as much time as possible to be left in a warm, dark and quiet environment. I’ve read a lot about “cluster care.” Cluster care (for those that don’t know) is a type of care that allows for most procedures and/or tests to be done all at once, eliminating repetitive interrupting of a baby’s sleep cycle. If a baby is interrupted minimally throughout the day then he will have the maximum time for sleeping, healing, and growing. Neonatal nurses take this into consideration and do their best to make sure this type of care happens for all of their patients. How wonderful. 2. Listen. Babies make different sounds when they need different things. If you pay attention, a person can distinguish between a “Hungry Cry” and a “I Need Some Love Cry.” All babies have a different cry for each need they have so it may take some practice. Eventually you’ll be able to know what your baby needs, purely based on the sound of their cry. Neonatal nurses have an incredible knack for this. They “just know” when their patient needs something. The ears of a neonatal nurse are always open, listening for alarms, or hospital announcements so it’s no surprise that their ears are tuned in to what their patients need at any given part of the day. Way to go nurses. 3. Watch. Babies give visual cues when they need something. For example, a hungry baby will put his hand up to his mouth or move his open mouth from side to side, searching for something to latch on to. If you watch closely, you can tell when a baby is hungry long before he cries. If a baby is uncomfortable he may purse his lips or squeeze his eyes shut (a sign that he may be in pain or does not like surrounding stimuli). These visual cues are called “early cues.” Crying is actually a late sign of a need not being met. Throughout your day, if you watch for a baby’s visual cues (something I practiced a lot with my son), you’ll be able to meet his needs before he even makes a sound. Neonatal nurses are constantly checking on their patients. They check to make sure temperature probes are secured in place, nasal prongs are in place, diapers are clean, the list goes on and on. They are always watching their patients. They can learn pretty quickly the visual cues that their patients give them so they can preemptively meet their needs. Very impressive. 4. Pay attention. Babies are communicating with us all the time. It is the responsibility of neonatal nurses to pay attention to the language each of their patients is speaking. Babies communicate through the way they respond to different situations or stimuli. When neonatal nurses pay attention to how their patients respond during activities, or to different ways of being held or touched, it is possible to know if a baby likes something or not. One way is by paying attention to their patient’s heart rate and/or blood pressure. If a baby’s heart rate or blood pressure goes up or down, or he is panicky and restless, odds are he probably doesn’t like what he is experiencing. By figuring out things that he doesn’t like, and then figuring out what he does like, neonatal nurses quickly find that calming him down becomes a lot easier. For example, if a nurse knows her patient doesn’t like getting his diaper changed and he becomes stressed, she’ll know that after a diaper change she will need to follow-up with something that soothes him, like singing to him or holding him. Neonatal nurses listen, watch and pay attention to their patients and their patients thank them for understanding what they are trying to say. How cool. 5. Learn. Learning about their patients (the things they like and don’t like) helps neonatal nurses to give the care their patients want. By being attentive to a baby’s visual cues and learning the sounds of different cries, nurses have the opportunity to learn a lot about their patients. NICU babies get core team nurses so the sharing of information becomes crucial. Example: It’s important that all of a patient’s nurses understand he doesn’t like teddy bears (if he doesn’t like teddy bears). Neonatal nurses keep their eyes and ears open and learn the languages of their patients. There’s a lot to learn about each baby, their individual situation and the specific care they are receiving in the NICU. Learning each of the situations is very valuable and comes in handy when talking with the family or deciding what is next in line for the baby’s care. Learning about each patient helps nurses get to know them individually and creates a bond and a relationship that helps the nurses give the best care possible. Amazing. 6. Talk with the family. When you are caring for a baby that came too early or a baby that is faced with a lot of complications, their family needs a lot of support. The birthing experience may not have gone exactly as planned and the parent(s) and family could be in extreme emotional distress. Neonatal nurses talk with the family of the little ones; this does wonders for the morale around the unit. The nurses personalize the care they are giving by using their patient’s name: “Jared had a great night.” Vs. “He had a great night.” If a family believes that you truly have their best interest in mind and the best interest for their baby, they may find it easier to relax and believe that they are in good hands. Families of children in the NICU oftentimes feel scared, isolated, confused and possibly angry. Nurses talk in quiet, calm tones and explain what they are doing and how they are doing it; this helps the family to feel included and not so alone. Involving parents in feedings, diaper changes, bathing and any other procedures will also help them to feel like they're involved in the care of their baby and not just sitting on the sidelines watching someone else care for their child. So great. 7. Care for them as if they were your own. As a mother, there is nothing more comforting than knowing that your baby is in the hands of someone that not only knows what they are doing but who also cares about your child and is doing the absolute best for them (most comforting and safest way possible). 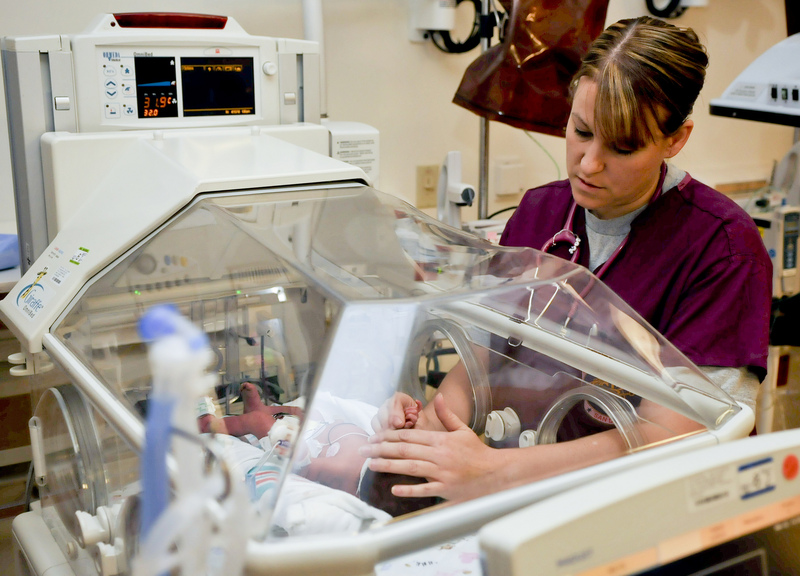 Neonatal nurses care for their patients as if they were their own. This allows them to have a certain sensitivity to what they are doing. It also allows the opportunity for the parents to be at ease when their child is left in the hands of their nurse. Parents are able to trust the nurses caring for their baby when they can obviously see that the nurse cares about their baby's well-being. Beautiful. 8. Stay curious. Sometimes there are things that we do day-in and day-out that at some point don’t seem to make sense anymore. Neonatal nurses are notorious for coming up with ways to improve the care they give. Nurses constantly keep their eyes open for products that will improve the care they give; making it more effective and productive for both the nurses and the babies. And, if there isn’t a product on the market that does what they want to do, they will fashion something up that will meet their need (this is how BMS got started; all by seeing a need and figuring out a way to manufacture a product that would fill that need). Nurses aren’t afraid to speak up, to say something. Just because something is done “The way we’ve always done it” does not mean that there aren’t other, more productive ways of accomplishing the same care. From what I can tell, nurses never stop looking for ways to improve the delicate care they give. I think that is astounding. 9. Love what you do. By waking up each day excited to go to work, neonatal nurses allow themselves the opportunity to look forward to walking through the hospital doors and seeing the faces of all of the babies they help to live another day. I can tell (based on blogs, websites and facebook posts) that neonatal nurses LOVE what they do and are very proud of the care they provide. By truly loving what they do, families of their patients know that neonatal nurses come alongside them and are cheering their baby on as much as they are. Families know that the nurses caring for their child are giving them hope for a better tomorrow. That is a priceless gift. Neonatal nurses have a thirst for knowledge that fuels their desire to help their patients grow and get better. Nurses live for the days when the babies go home with their families and they morn with the families who will go home without their baby. The occupation that neonatal nurses have chosen is not an easy one but it is certainly a rewarding one. To neonatal nurses everywhere: Thank you for all you do!